The artist's conk, scientific name Ganoderma applanatum, is a polypore fungus that grows in subtropical areas all around the world, in the Americas, Asia and Africa. 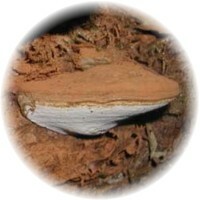 Artist's conk is mainly important for its value as a health supplement. This perennial mushroom can be found on dead or sick hardwood trees, where its mycelium consumes the rotting wood. Artist's conk has an annual life cycle and produces a huge number of spores, hundreds of millions being released in the air. When found on sapwood, Ganoderma applanatum acts as a pathogen. Artist's conk attacks trees that are wet, especially elder ones. Beech and poplar are often killed by this fungus that starts their decay. Other species can also be affected, these include willows, western hemlocks, Douglas firs, old or sick olive trees, spruce, alders, apples, elms, buckeye and horse chestnuts, maples, oaks or walnuts. Artist's conk is a medicinal mushroom but not as popular as Ganoderma lucidum. This related species, also known as the lingzhi or reishi mushroom, is considered more beneficial for health. G. applanatum has a complex taste, bitter and smoky, and is usually consumed as a tea. What makes artist's conk unique and gives it the popular name is the use in art. It is very suitable for this purpose due to the very large size, with woody brackets and a surface covered in white pores that immediately become brown on touch. As a result, it is a natural canvas for artists. No tools such as paint, pencils or pens are needed, artists can easily create sketches on the mushroom's surface by scratching it lightly. As soon as the mushroom is harvested, its pores no longer grow. This means that the stains become permanent and remain on the surface. Since G. applanatum produces conks with a woody texture, they can be preserved for a long time and decay slowly. If dried and stored indoors, artworks created on this mushroom can last several years. Artists can use these mushrooms in two ways. When fresh, they can be engraved, while dry ones can be painted or used for landscaping. Since the mushrooms can be placed on tables or shelves just like objects, the paintings on their surface are displayed in a special way. When dried, artist's conk lasts for several years and turns as hard as wood. The cap is convex, similar in shape to a hoof, fan or kidney, with a length between 4 and 24 inches. After the first year, they become very hard and the surface can develop lines, bumps or cracks. The normal color of the cap is grey but it becomes brown during the summer, due to the very large number of spores that cover it. Mature specimens can have a thickness of several inches. While the pores on the surface are normally white, touching or pressing them changes the color to brown. Every year, a new layer of pores with a thickness between ¼ and ½ in grows on top of the old one. These mushrooms rarely have stems but these are very hard to remove when present, since they attach to wood on a wide area. The flesh has a very durable texture and varies in color between white and brown. The brown spores change the color of the cap when they cover it during the summer season. A very similar species is Fomitopsis pinicola, or the red-belted polypore. This mushroom has a cap with either black or green zones and the outer edge includes a red or brown band that gives the species its popular name. Both the flesh and the spores are white. It can grow on hardwood trees but is more common on pines and hemlocks. Just like Ganoderma applanatum, it can be used by artists but the result will be different, with a yellow color. It can grow larger than the artist's conk, with yellow pores as they dry. Artist's conk is well-known in Asia, where it has been used as a traditional medical mushroom for a very long time. It is named as shu-she-ling-zhi in China, while the Japanese name is kofuki-saru-no-koshikake, which means "powder-covered monkey's bench" in a direct translation. Modern scientists have accepted the medical benefits of the mushroom, after studies have revealed powerful anti-tumour, anti-fibrotic and anti-bacterial effects. While the species is mostly used by artists, it has become increasingly popular as a natural treatment. Artist's conk shares medical benefits with all of its Ganoderma relatives. G. lucidum and other Ganoderma species are considered to be a general panacea in Chinese medicine, where they are used against any condition, including infections and severe chronic diseases. The mushroom must be administered as a tea or tincture, after it is dried and cut in small pieces. This is due to the hard woody texture that makes it inedible. All Ganoderma mushrooms are extremely rich in bioactive compounds and around 400 different phytochemicals have been identified in artist's conk. Some of the most exciting are the triterpenes and polysaccharides with proven bioactive effects. These are thought to be effective hypoglycemic, anti-fibrotic, antioxidant hepatoprotective, anti-cancer and immune-modulating compounds, so several research projects focus on them. Using state of the art sequencing technologies, scientists have managed to map the whole genetic code of artist's conk in 2015. A content of guanine and cytosine of 26.66% was found in the circular genome of the species. The genetic code of G. lucidum has been mapped as well, which allowed a direct comparison with the one of G. applanatum. The main difference is the amount of transfer RNA, which is needed in order to send genetic information from the cell. Scientists will be able to better understand the medicinal effects of the mushroom from now on, since the mitochondrial genome of Ganoderma applanatum has been fully deciphered. Several systems of traditional medicine use the species and its benefits have been known since ancient times. It is very popular in Chinese medicine, where it plays many roles. Artist's conk is especially employed to reduce heat and excess phlegm, as a treatment for indigestion and as a painkiller. The taste of artist's conk depends on the host tree type. It is said to provide an immediate energy boost and is mainly consumed as a liquid, either in the form of tea or as a water extract. Artist's conk can be prepared as a tincture or tea but it is otherwise inedible, due to the woody structure. It is a good idea to start with a small amount, in order to prevent possible allergies. It can also have side effects if you take medication or suffer from certain diseases. It is rich in polysaccharides and triterpenoids with bioactive effects, so it is wise to ask your doctor before consuming it. The species can also be used as a colorant or dye for fabric, wool or paper. If ammonia is used as a mordant, the mushroom can give wool an attractive rusty color. The artist's conk is special due to its use as a material by artists. The surface is normally covered by pores with a fresh white color. Rubbing or scratching it will immediately reveal the brown tissue under the pores, so it is very easy to create lines or shades. After the mushroom dries, these marks become permanent. Artist's conk is mainly used in medicine and artistic creations. However, it can improve the flavour of a number of Asian recipes. It can give food a very pleasant mushroom taste but it is inedible itself and can't be digested. However, ganoderma drinks can be produced by cold pressing with water or blending and filtering the juice. Ganoderma applanatum is a prized flavour enhancer in Asian fermented foods when added in small slices and can also be fermented with lemons and onions or included in hot herbal soups. Artist's conk is not cultivated but they are very easy to find in the wild. They grow on either dead or old hardwood and the best place to look is near forest streams, where the air is moist and there are usually dead trees. The highest chance to find them is on maple trees that are decaying. The woody smell of these mushrooms is very strong. Artist's conk has a long history of use in traditional medical systems, with no attested side effects. But it is a good idea to ask for medical advice before using artist's conk. This is because it is possible that some compounds in its composition might interact with commercial medication or supplements. You must be very careful when you harvest these mushrooms for art purposes. You can typically remove them through force, by pushing downwards from their top. However, old artist's conks can become very hard and you'll need a hatchet or another similar tool. The best tactic is to push from several directions and slowly loosen the mushroom. You don't want it to drop to the ground, which results in immediate bruising. The pore surface that will be used as a canvas is very sensitive, so avoid touching it or it will change color immediately. The pores should not touch anything at all during transport. Fresh artist's conk can be used to produce designs with sepia colors; the technique is the same as normal dry point etching. After it dries up, the pore surface becomes very hard and it can be used as a canvas for painting. This is also true if the mushrooms are harvested during the winter, when it is impossible to etch them. The very strong smell of the artist's conk is also considered pleasant.